Ooh, that's a great idea! Would definitely add some color and even more texture to the vases. wow... thanks for the step by step. I keep seeing it on Pinterest and I didn't know if it would actually turn out. I love it! That sounds like a good idea. I've found examples where people spray painted the jute after it was already applied, but I've also seen (on amazon) that you can buy colored jute. How do you end at the top of the bottle? Do you mean the first image? Thank you for letting me know! I will add a link in the photo caption to credit you. I just did my own set of these with twine... hadn't thought of the yarn though, fun idea to add color! Another great option is to use glass candles! Especially the larger candles that tend to get ugly scorch marks along the inside... a great way to still use the candle to the very end without the ugly black soot! I like your glass candles idea! I think this twine-wrapping concept is so versatile that it could be used just about anywhere. I have done this on flower pots big and small ...gorgeous!!! I've been waiting for something cute to decoration the open space over my kitchen cabinets. I think these would be cute with mixed jute colors and letting a candle melt all down the jute. I would mix the candles in color and let some of the candles drip down on the other candles (holding a dripping candle over another candle). I am working on this now and not liking the sloppy look of the glue. I hope it is not noticeable when it dries. And, I was just thinking that these really can't be washed, right? If they come out okay, I am going to give them to my sister-in-law as part of her Christmas gift. She bought me the yarn for Christmas last year and I have leftover from a crochet project. Christine, don't worry about the glue. Once it dries, it becomes clear so it won't look messy at all. I would be careful with any washing. The way I envisioned these vases was not for use with live flowers, so I wasn't planning on washing them. Oooh that sounds like a great idea! I bet the gluing process would go much faster that way. Let me know how it turns out! Love this!! I have all of these bottles around the house because I knew I would find something to do with them. Thanks for sharing! Thanks for stopping by! Let me know how your bottle vases turn out! I've made a few of these with wine bottles. A hot glue gun is a MUST! It dries instantly... no holding it in place & waiting. All you need is a little dollop. I would like to do this for a gift any idea on how to stencil some words on them? and if I wanted to use them as vases and thoughts on spraying them with clear spray paint to seal? 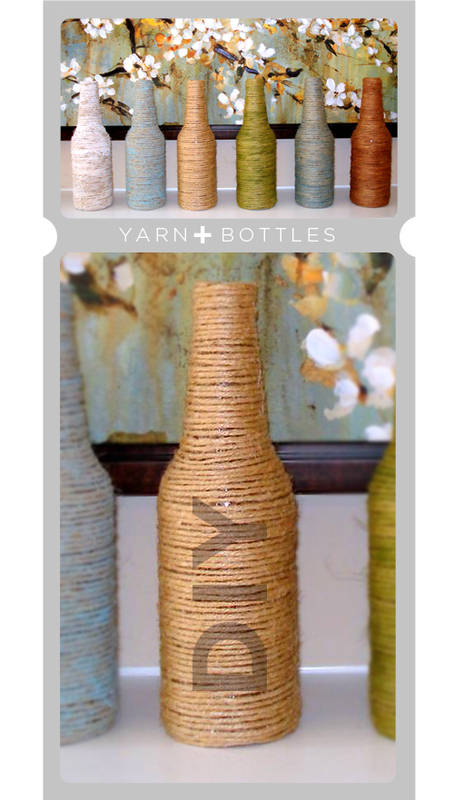 For stenciling, you can try wrapping jute or yarn around only part of the bottle, like I did for our wedding centerpieces. You can try wrapping the bottles only half way up, or just around the top and the bottom, and this would leave you some room for stenciling. Or you can try etching the glass instead - Young House Love has a good tutorial on this. If you go that route, I would suggest etching first and wrapping the bottle with jute second. As for spray painting, I've definitely heard of jute being spray painted, but I'm not sure if that would "seal" the vase enough to protect the jute from absorbing water. I bet a stamp would work well. Thanks for this tutorial. You did a great job. I also pinned this to my blog as I was in need of some spring-spiration. I will be gathering some thick yarn from my moms house this week and perhaps give this a try soon. Thanks for the tips. You did a great job and I really like the mix of colours. Thanks, Crystal! Good luck with your project! I am moving this weekend and have all these on hand! Now I van decorate my kitchen by using bright colored yarn. That's great! And good luck with the move! I can't remember exactly, but I think it was no more than half a roll of jute (maybe less). Hope this helps! Would the jute with Elmers glue stick to plastic bottle, or just glass bottles? I haven't tried it with plastic bottles, but I imagine it should work.